Artist Mitch D’Arte Explores Faith, Belief and Religion in Show at Galería E.V.A. Nationally recognized artist Mitch D’Arte works in a variety of styles — from lotería graphics to typographic collages, to acrylic paintings which evoke the colorful traditions and art of Mexico. 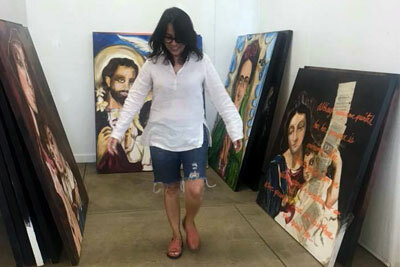 For her latest exhibit, Christ Like: Restoring Faith and Inspiring Reverence, which opens on April 6 at Galería E.V.A. 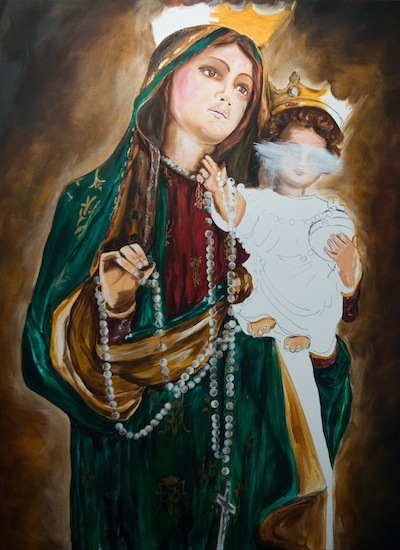 in San Antonio, D’Arte has chosen to highlight her “religious footprint” with portraits of the Virgin Mary and other works of religious iconography. 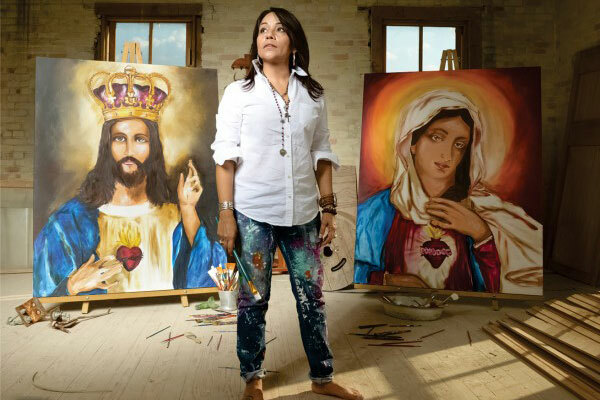 ​”Growing up poor has given me a fondness and connection to all things humble which provoke emotions, anything rich in history and culture, things that show evidence of the past and traces of the human spirit,” D’Arte says. UNO by Mitch wrist cuffs. 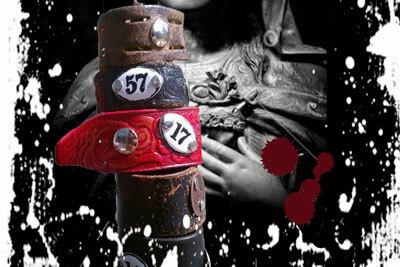 Her connection to the past inspired D’Arte to create a line of wrist cuffs, UNO by Mitch, fashioned from discarded leather belts. 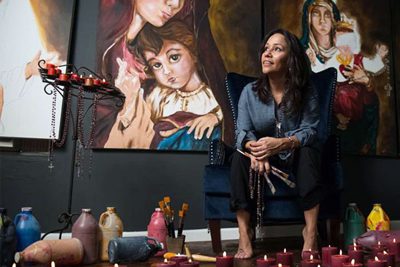 She says the profits from this business help sustain her “painting addiction” and her “missionary” work in the villages near San Luis Potosi, Mexico, where she and a group of gay friends who have no kids have distributed over 2500 Christmas gifts to more than 700 needy children. “Christ Like: Restoring Faith and Inspiring Reverence,” featuring the artwork of Mitch D’Arte, April 6 to 27, 2018 at Galería E.V.A., 3412 S. Flores. 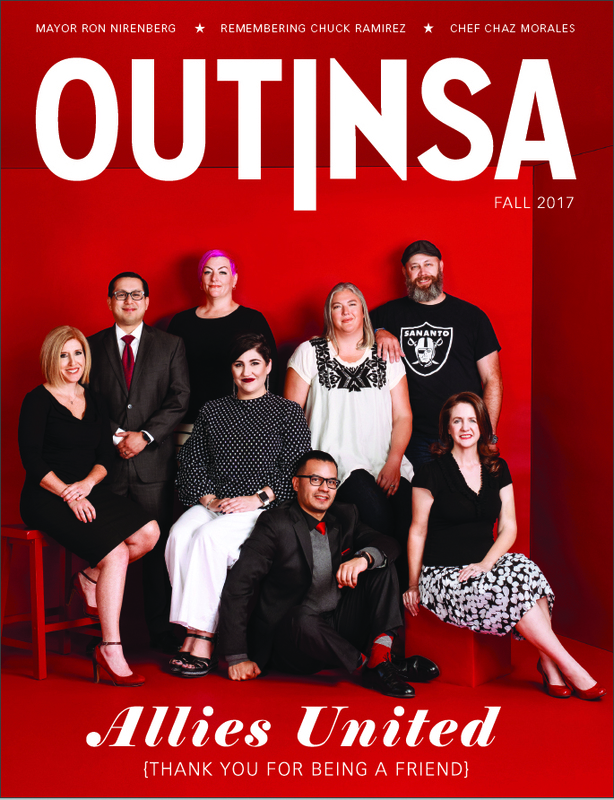 Opening night reception from 5 p.m. to midnight hosted by Rosie Gonzalez and Stacy L. Speedlin with emcee Fonda Cox and featuring Conjunto Taller, the Frank Gomez Band with Clemencia Zapata on percussion, and a special appearance by Flaco Jimenez. Fiesta medal vendors welcome. Opening night guests are asked to bring a Barbie doll or a Hot Wheels Car as a donation for a toy shipment to Mexico. Exhibit is underwritten by the Law Office of Rosie Gonzalez, CWLS, and Dr. Stacy L. Speedlin.